Please note: The old tabbed interface is still available. In the past, we asked you to use the Citation Linker to check whether a specific book or article is available at the library. Contrary to expectations, the Citation Linker did not search all our holdings, but only parts of them. That’s why we replaced the Citation Linker with the new search interface. Please note, that the ILL order form will not be auto-populated with the bibliographic details of your search! That’s why you will have to repeat them when placing your order. We realize that placing an ILL order in that way becomes more tedious. However, by providing you with a tool that searches across all our holdings, we are confident that we can make many ILL requests unnecessary in the first place. 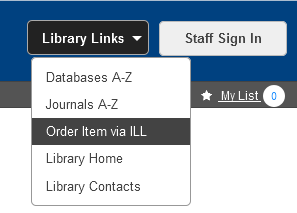 A reference manager—or: bibliographic management software—that supports the usage of a library’s link resolver can annotate each of your references with a link to the full text. Upon click that link checks the availability of the full text through your library and—if available—redirects you to the full text. Users of RefWorks do not have to update anything, since the IRC/Library has applied this change on their behalf. Copyright © 2019 IRC/Library. Powered by WordPress. Theme: Accelerate by ThemeGrill.